Hidden Springs Maple was started by me and my husband, Peter Cooper-Ellis, as an online retail maple syrup business. Peter and his family began making maple syrup over 50 years ago on a few acres of sugarbush land in southern Vermont. Today, the sugarbush spans nearly 1,000 acres and we operate an online retail business and a farm store in Putney, Vermont. The store sells Hidden Springs Maple syrup, syrup from other local producers as well as a variety of gourmet food products made with maple syrup, other locally-made edibles such as honey, hot sauce, and cookies, and arts and crafts from local Vermont artisans. Hidden Springs Maple will start selling ice cream cones this summer and hosts several events during the year including an open house during The Putney Craft Tour and a booth at The Strolling of the Heifers. I run customer service for Hidden Springs Maple and do all of the accounting and payroll. I like to look at numbers. I figure out how to offer the highest quality of products and services to our customers without wasting resources. When I was eleven years old, I remember the cars lining up at the gas pump during the oil embargo. Some thirty-three years later, I have a much better understanding of what happened back then, what our energy needs are now, and how we have to make changes going forward. So I began to make changes. I drive a hybrid electric car, hang my clothes up to dry, use energy-efficient light bulbs, and have a compost at my home and business. With the opening of the Hidden Springs Maple store in November 2011, we now had a southern facing 2,046 square foot roof on which we could put solar panels. Why not use the sun to power the heating and cooling system that was running on the earth’s natural heat pump? The sun and earth working together sounded like a great idea to me. So, I researched getting solar panels for our store roof and a friend recommended Prudent Living for their excellent service and expertise. Tim Biebel at Prudent Living was very helpful in explaining the up-front costs as well as the long-term savings. He did a complete analysis of our energy needs to determine how much electricity our system would generate per year and how many years it would take for the system to pay for itself. In addition to the energy cost savings, we would also receive over $10,000 back from the state of Vermont, a Federal tax credit worth nearly $25,000, and we could depreciate the installation cost on our tax returns. At an annual production rate of 26,859 kWh, our system would pay for itself in seven years, after which time it will actually start earning us money. The numbers said it all. So, we hired Prudent Living to install seventy-two 235-watt solar panels on the roof of our retail store building and an additional meter to record the kWh output of our PV system so that Green Mountain Power (and we) will know how much the system is generating. As soon as the panels and two inverters were installed, the system was ready to generate electricity. We just pushed a button to turn it on and the sun started working for us. 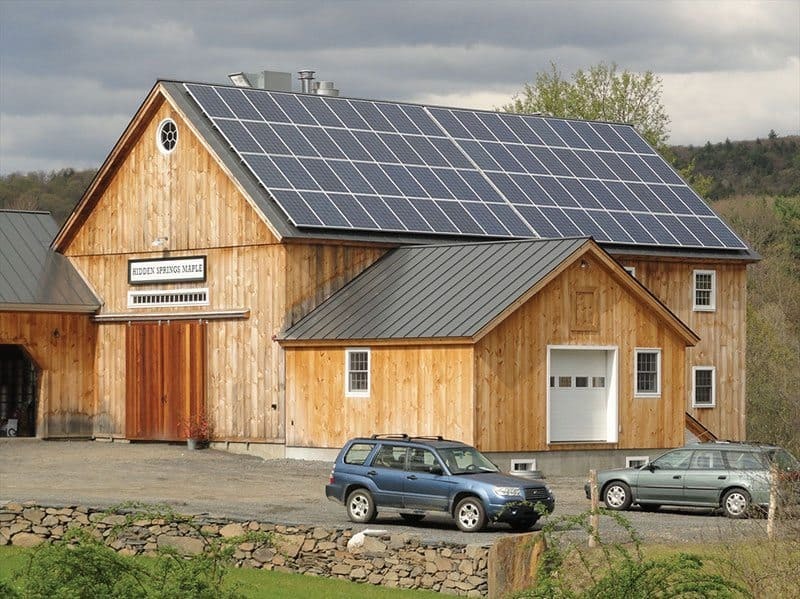 As a Green Mountain Power customer with a photovoltaic system, we receive a credit of $0.06 per kilowatt-hour (kWh) of electricity that our system is generating. The first electric bill we received after the panels were installed showed a negative balance due. This balance becomes a credit back to us in the winter when the geothermal will be using more electricity and the sun will be generating less. Over the lifespan of Hidden Springs Maple’s new PV system, we will be eliminating 551 tons of carbon dioxide (CO2), which is the equivalent to planting 2,755 trees or a reduction of over a million miles of driving. The PV system makes sense for both our business and for the environment. 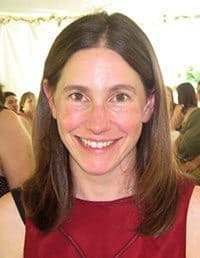 Sarah Weck is the manager of Hidden Springs Maple and the wife of Hidden Springs Maple founder and owner, Peter Cooper-Ellis. Sarah handles all customer service inquiries and accounting and also does some sales and marketing. Interacting with customers is what she loves most about her job.